Hurricane Harvey dropped record rainfall on Houston neighborhoods like this one, near Addicks Reservoir. 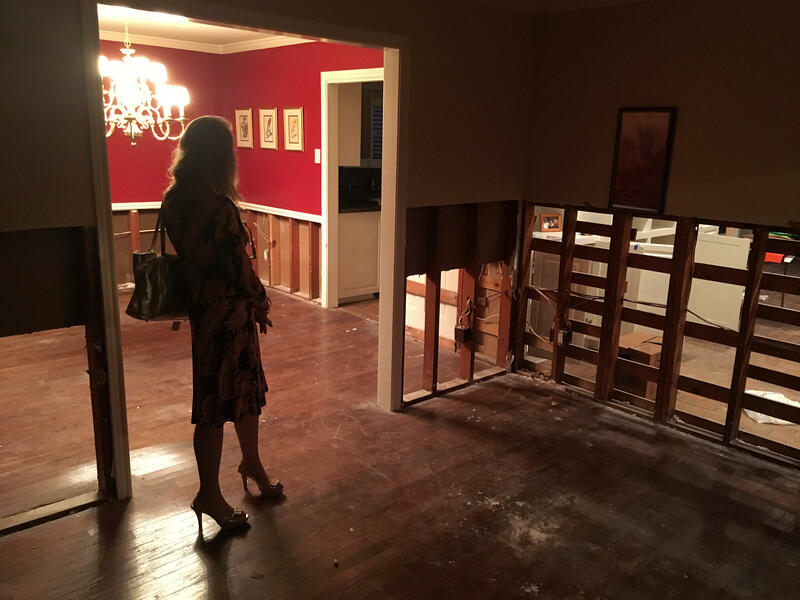 Mary Wilkins stands inside her damaged house in Houston's Meyerland neighborhood. Hydrologist Jeff East stands under one of those freeways, beneath an overpass and above the east fork of the San Jacinto River. The river is more like a trickling stream, 20 feet below. But East points to a line of seeds and debris in the grass by the highway. "Actually there's a high water mark over here," he says. Debris left at the high-water mark is like a bathtub ring around Harris County. Along with gauges in the San Jacinto River, it shows flood levels never seen before. "This is the highest that it's been since we've been gauging the site since the 1940s," East says. The San Jacinto is a perfect example of what went wrong. Normally it's pretty tame; the flow is about 30 cubic feet per second (a cubic foot is about enough to fill four basketballs). But during Harvey, the river was running at 80,000 cubic feet of water per second — headed south toward the city. The San Jacinto is just one of many streams and rivers that flow into Houston. The city is kind of like a drain in a huge bathtub. People have known that for years. In the 1940s, after huge floods, the city tried to stop the water before it reached Houston. Engineers built two reservoirs, called Addicks and Barker. Richard Hyde used to live near Addicks reservoir. Hyde's a retired petroleum geologist. He says that during Harvey, his house filled up fast. "I took a look out back and the reservoir was coming up on the back deck and heading for the sliding door window," he recalls. He got out when it reached the electrical outlets in his house. "I got 6 feet of water in the house," he says. In the apartment he's living in now, he shows me a map of the area from the 1970s. To the west it's prairie and rice fields, the kind of land that soaks up rain. In a current map, it's now paved — houses, shopping malls, roads. That pushes more water into Houston. Years ago, there was talk of building a third reservoir. "They did not build the third reservoir, which was so badly needed. They built houses," says Hyde. "Houses get tax money and reservoirs don't." At Harvey's peak, the reservoirs couldn't handle the water. Engineers opened spillways and water shot downstream toward the city through concrete-lined bayous. Runoff from paved roads and neighborhoods ran into the bayous as well. One of those, Brays Bayou, flooded a neighborhood called Meyerland. It's upscale, but that didn't protect it. Ruined drywall and carpeting remains piled on the sidewalks. Mary and Randy Wilkins' house is two blocks from the Bayou. "It's a wreck," says Mary Wilkins. Fans are running, big industrial size ones, drying out the mildewed walls — or what's left of them. They're gone up to chest height; it's just wooden studs. Most of the furniture is gone. "That couch was like floating throughout the house," she says. Randy Wilkins says they've flooded three times now: "2015, '16 and '17 we flooded." "Every year," adds Mary Wilkins. "It just blows my mind." They say Harvey was the worst flood by far. Mary Wilkins blames overdevelopment outside the city. "They've just let them build without accounting for how their drainage was going to be addressed," she says, "so it just keeps coming downstream ... from rice field to concrete, where's the water going to go?" The Wilkinses have rebuilt twice before after floods; this time they're selling it for whatever they can get. Sam Brody, a flood scientist at Texas A&M University, says Houston has grown to a size where it can't handle these kinds of record rainfalls. "We're piling in people with roads and rooftops and parking lots into these low-lying coastal areas and exacerbating these problems," he says. "And that is an urban, human development, built-environment problem." You can't move Houston. So what's to be done? Officials are now talking about building that third reservoir and demolishing houses that repeatedly flood. Brody's team is advising those officials. He says the city needs more radical changes, like requiring new homes to be built 3 feet above flood level. He says yes, preparing for future floods will be expensive — but cheaper than paying up after the next one. Hurricane Harvey caused the worst flooding in Houston's history. Scientists are looking into why it was so bad. As NPR's Christopher Joyce reports, a lot of it has to do with how Houston was built in the first place. CHRISTOPHER JOYCE, BYLINE: Houston is a sprawling web of concrete, 10-lane freeways and miles of strip malls. Under one of those highways, I meet hydrologist Jeff East. He's mapping where the flooding went. So what do we got here? We got an overpass of a highway. JEFF EAST: Right. This is the east fork of the San Jacinto River. During the flood, the water got up - actually, here's a high-water mark over here. JOYCE: Over here is in the grass beside the highway. The river is a trickle now, about 20 feet below us. But when it flooded, it was up here by the roadside where it left its mark. EAST: Debris from - right - that would've floated during the flood. And then when the water, you know, went back down, it just sort of left it. JOYCE: That debris is essentially a bathtub ring around Harris County. Along with gauges in the San Jacinto River, it shows flood levels never seen before. EAST: This is the highest that it's been since we've been gauging the site since the 1940s. JOYCE: East's team at the U.S. Geological Survey has taken some 1,500 measurements so far. Hundreds are record breakers. Take the San Jacinto, for example. Normally, pretty tame; the flow is about 30 cubic feet per second. A cubic foot is about enough to fill a basketball. During Harvey, the river was running at 80,000 cubic feet of water per second headed south toward the city. So I go south, too, following the flow. Driving on a highway 30 miles north of Houston, you can see basically what happened to the water that fell during Harvey. There's no place for it to go. This is almost all paved. All that water moved south toward the Gulf of Mexico. The problem is that Houston is in the way. The San Jacinto is one of many streams and rivers that flow into Houston. The city is kind of like a drain in a huge bathtub. And people knew it. In the 1940s, after huge floods, the city tried to stop the water before it reached Houston. Engineers built two reservoirs called Addicks and Barker. That's my next stop to talk to Richard Hyde. Hyde's a retired petroleum geologist. His house sits on the edge of Addicks reservoir. He says it filled up fast. RICHARD HYDE: Took a look out back, and the reservoir was coming up on the back deck and heading for the sliding door window. And I got 6 feet of water in the house. JOYCE: In the apartment he's living in now, he shows me a map of the area from the 1970s. To the west, it's prairie and rice fields - the kind of land that soaks up rain. In a current map, it's now paved - houses, shopping malls, roads - and that pushes more water into Houston. Years ago, there was talk of building a third reservoir. HYDE: They did not build the third reservoir, which was so badly needed. Instead, they built houses. Houses get tax money and reservoirs don't. JOYCE: At Harvey's peak, the reservoirs couldn't handle the water. Engineers opened spillways and water shot downstream towards the city through cement-lined bayous. And runoff from paved roads and neighborhoods ran into the bayous, as well. One of those, Brays Bayou, flooded a neighborhood called Meyerland. It's upscale, but that didn't protect it. Piles of ruined drywall and carpeting still lie on sidewalks. Mary and Randy Wilkins' house is two blocks from the bayou. You want to go inside? MARY WILKINS: Yeah. Let's go inside. It's a wreck. JOYCE: You got the fans going. The walls are gone to chest height, just wooden studs. Most of the furniture is gone, too. WILKINS: That couch was like floating throughout the house and my other couch, as well. JOYCE: Randy Wilkins, who has a speech impediment, says they've flooded three times now. WILKINS: 2015, '16 and '17, we flooded. WILKINS: For three years, I just like - it blows my mind. JOYCE: The Wilkins say this was the worst flood by far. Mary Wilkins blames overdevelopment outside the city. WILKINS: They've just let them build without accounting for how their drainage was going to be addressed. So it just keeps coming downstream. And I think that from rice field to concrete, where's the water going to go? JOYCE: The rainfall was record-breaking, but that's just part of the story. People built Houston in a way that made things much worse. That's a point that flood expert Sam Brody at Texas A&M University wants to drive home. SAM BRODY: We're piling in people with roads and rooftops and parking lots into these low-lying coastal areas. We're exacerbating these problems. And that is an urban human development built-environment problem. JOYCE: You can't move Houston. So what's to be done? Officials are now talking about building that third reservoir and demolishing houses that repeatedly flood. Brody's team is advising those officials. He says the city needs more radical changes, like requiring new homes to be built 3 feet above flood level. He says, yes, preparing for future floods will be expensive but cheaper than paying up after the next one. Christopher Joyce, NPR News. (SOUNDBITE OF EVIL NEEDLE'S "LOUNGIN") Transcript provided by NPR, Copyright NPR.